Water safety is as important for babies and infants as it is for the adults that care for them. Unfortunately, a one-year-old baby was involved in an accidentally drowning in Kinderhook over the weekend, bringing the importance of water safety to life. While babies can’t necessarily learn how to swim, there are preventative measures you can take if you have a backyard pool. While your baby may not be able to learn how to swim, they can still get acclimated to the water. 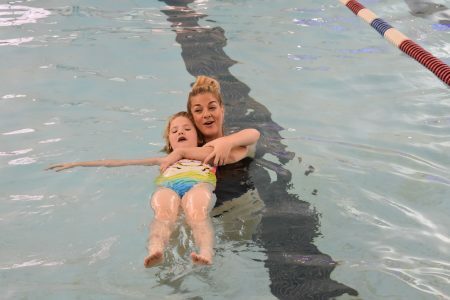 At the Y, we offer Parent/Child swim lessons that help your child get used to being in the water, how to blow bubbles, and most importantly, learn how to float. Kids need to learn how to float before they can learn how to swim. You are required, by law, to have a fence around your in-ground pool. The fence must be at least 4 feet high and no more than 2 inches off the ground. This is to keep children and animals from wandering into the pool area unattended. We also recommend that you avoid installing a chain-link fence as they are easier for young children to climb. Install motion-activated alarms on the doors leading into your pool area. That way, if a child or an animal enters the pool area, you will know immediately. Lock all doors leading into your pool area. Lock them from the inside and lock the gate from the outside. Always check locks when leaving or entering the area. Learning CPR can save a life and can buy you time before the paramedics arrive. Know who is in charge at all times. If you’re having a party, or there’s a large group of people in the pool area, designate someone to be in charge of pool supervision—someone should have their eyes on the water at all times. Supervision is the most important part of infant water safety and alcohol impairs your ability to supervise. You should avoid all inflatable pool toys and flotation devices. Inflatable swimmies aren’t always reliable—they lose air quickly and can do more harm than good. Coast Guard approved life jackets are your best option and they should be on your child at all times when in the pool area. We recommend purchasing a Turtle Safety bracelet. These bracelets are designed to keep children safe around water. The bracelet goes around your child’s wrist and sets off an alarm inside the home if it hits water. So if your child accidentally falls into the pool, you will be alerted immediately. If you lose track of your child, always check the pool first. It’s easily the most dangerous part of your home and it takes seconds to drown. Always clear the pool before looking elsewhere. 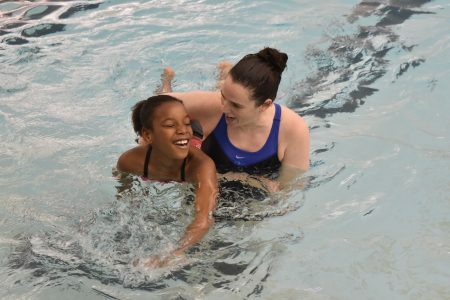 If you’ve had a great experience with our swim lessons, we would love to hear your story. Click here to share your experience.